Rodney Willett's Blog: Will my editor like it? And watering cans. As Marcia awaits her editor's comments on the last manuscript, I am reminded of another novelist for whom Totnes became home: Mary Wesley. She and Marcia knew each other when Marcia started writing but before she had a publisher. During this period, Mary was always very supportive. Then came the day that Marcia received her first contract. They met – quite near to The Brioche as it happens – and what Mary said has remained with Marcia ever since. 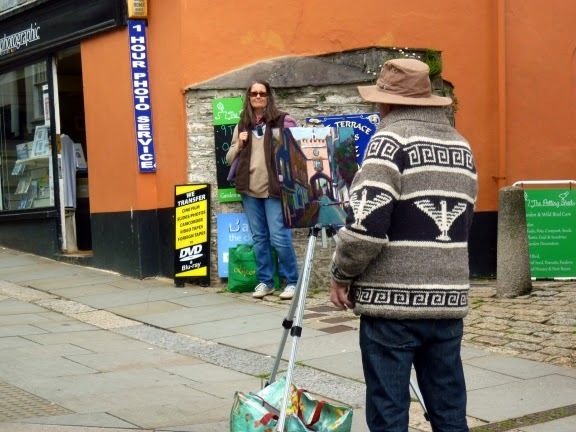 I had just walked down Totnes High Street to meet Marcia when I saw this artist painting East Gate. As I took his photo I realised that there, in the background, was Marcia. These novelists get everywhere. It may not sound like it but Mary continued to give Marcia encouragement and they remained friends until Mary died. I have a vision of them on the lawn in the Inner Courtyard at Dartington Hall during a Ways With Words Festival. The sun was shining. A game of croquet was in progress: Mary Wesley and James Long versus Marcia Willett and Joan Brady. Marcia and Joan lost: Mary and Joan fiercely competitive, James and Marcia far more laid back. Four very different novelists but all hugely talented. So, I thought I would put these two creative people together for you. The one on the left needs no introduction. The one on the right is local artist Stephen Bower. 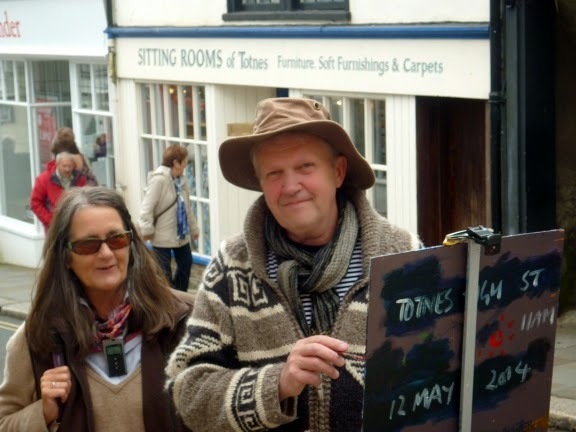 He has a gallery at 1a High Street so, if you are in Totnes, why not pop in and see what's on display? Oh, and yes, Marcia could write another book. Over the years, inevitably, people move on. Mary has died, Joan has moved to Oxford and James to Bristol. James and I keep in touch – just – via “social media” and he seems to be quite happy. We have lost touch with Joan. This year there will b e another “Ways With Words” at Dartington but, as with all the literary festivals, it has changed. Now the speakers are far more interesting than writers – they are people of the world who can (and do) speak on almost every subject under the sun. As such they are far better value than the novelist who spends most of life in a private world away from the hustle and bustle of real life. This may sound as if I am unhappy at the changes. Far from it. It seems to me that it is through their books that the novelist lives and by their books that a novelist is best remembered. Too often knowing a creative person (I have a feeling this is also true of composers and painters) gets between the work and the reader/listener/viewer. Some novelists manage to be “people of the world” as well as writers but they are few and far between. What a difference a few days of sun and warmth can make? Driving home,. 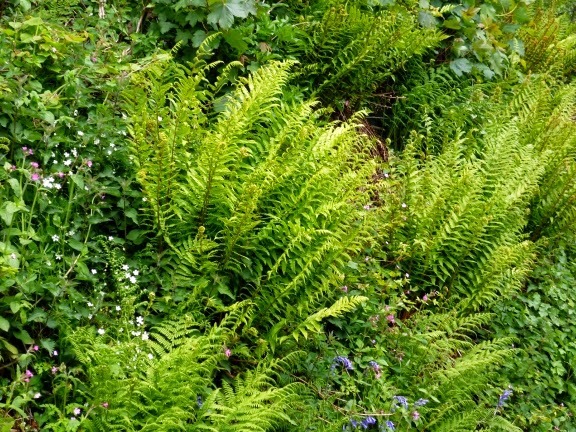 we suddenly realised that the ferns on the lane banks has arrived - just like that. A week ago and you were hardly aware of them but now they are obvershadowing everything else. Marcia says, and I think she is absolutely right, that she has one story to tell (the story explaining how she became a writer) and she has told that story at a number of festivals. Since the people that go to festivals tend to go back year after year and she has no desire to become a bore by repeating her one story to substantially the same audience, she gently but firmly declines all invitations to such events. 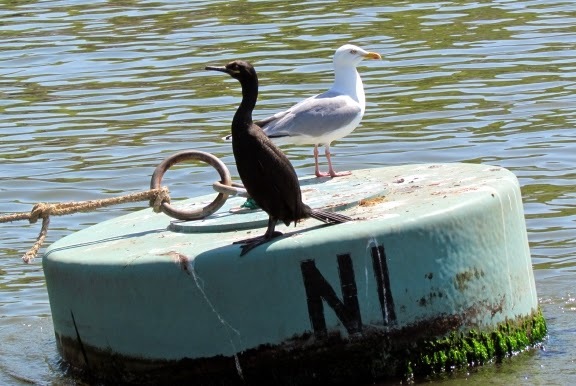 Yesterday, my friend Roger and I spent the day on the River Dart so that I could take some photographs and shoot some video. Here's a sample. Finally, I have good news to share with you: the ash tree lives. Thus we may reasonable expect a splash this summer. I really do need to buy a new watering can (my favourite got lost in the move – no idea how). Some watering cans seem to balance nicely and you can control the flow with ease: others seem to make one awkward and are difficult to carry. I sometimes wonder whether the people who design such simple things ever use them. Two months ago, Hermione's life was turned upside down when her people split up and neither of them could keep her. 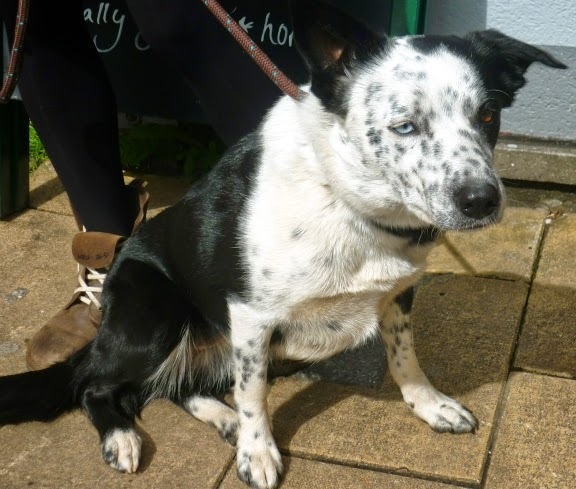 It was Katherine who came to the rescue and the two of them are now happily living together.